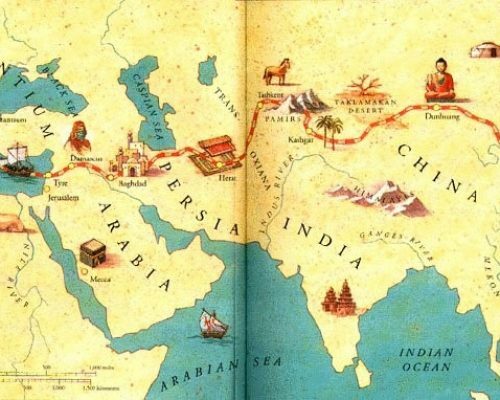 The Silk Road (Silk Route) was an ancient network of trade routes founded during the Han Dynasty of China, that went through the regions of Eurasia and linked them in commerce. While many kinds of goods traveled along the Silk Road, the name Originated from the silk which was the Chinese Valuable commodity. The Silk Routes expanded from China through India, Asia Minor, Mesopotamia, Egypt, the North African continent, Greece, Rome, and finally Britain. The northern Mesopotamian region (present day Iran) was China’s closest trade partner, and they initiated important cultural exchanges. These ancient roads had no particular name. In the mid-nineteenth century, Baron Ferdinand von Richthofen, the German geologist, named the trade and communication network “the Silk Road”. It was supposed a safe trading network of roads and even the Chinese extended their great wall to ensure its safety. The roads were used from 130 BCE, when the Han officially established trade with the west, till the Ottoman Empire prohibited trade with the west and closed the roads. 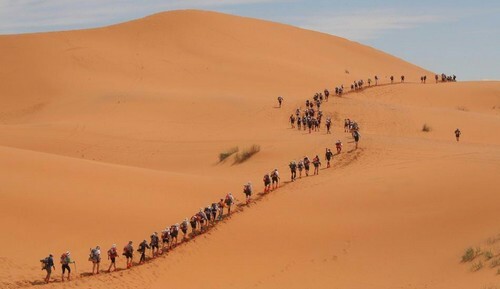 The history of the Silk Road refers to the time before the Han Dynasty, known as the Persian Royal Road, which was of the main thoroughfare of the Silk Road. It was established during the Achaemenid Empire (500-330 BCE). The Persian Royal Road stretched from Susa, in Persia (modern day Iran) to the Mediterranean Sea in Asia Minor (modern day Turkey). There were postal stations along the route with fresh horses to deliver messages throughout the Persian empire, quickly. The Persians protected the Royal Road attentively and expanded it through smaller side roads. These routs eventually stretched from east into India, and from west into Egypt. In addition to the silk, also spices, textiles, grain, fruits, vegetables, animals, tools, metal work, wood work, art work, gun powder, religious objects, precious stones, and much more were traded through the roads. The greatest legacy of the Silk Road was the exchange of technology, language, Art, religion, culture, philosophy, science, architecture, and every other civilization element beside the commercial commodities. The main traders in the road were the Persians, Chinese, Jews, Arabs, Greeks, Bactrians, Syrians, Turkmens, Indians, Romans, Georgians, and etc. In the Dark Ages, caravans traveled through the silk roads were welcomed in large guest houses, so they had opportunity to meet other merchant travelers, and exchange cultures, languages and ideas. Caravans’ travelling continued until the 19th century. This caused a network of caravanserais to be formed in China, India, Iran, Turkey, the Caucasus, North Africa, Russia and Eastern Europe. Many of them still stand. In the nineteenth century, a new type of travelers such as geographers and archaeologists explored the Silk Roads. Regularly, they were from France, England, Germany, Russia and Japan. The silk road enters Iran through Khorasan and passes Tous, Nishapur, Sabzevar, Shahrud, Damghan, Semnan, the ancient Rey and Qazvin, and from there it is divided into two branches. One path goes toward the Northwest through Sarab, Tabriz, Marand and Khoy and afterward out of Iran. The second path stretches to Hegmataneh (today Hamedan), Kermanshah and exits from the west of Iran. In the recent decades, UNESCO has tried to revive the silk road in the countries including Iran that form the chain loops of this precious heritage. Simultaneously, Iran government has taken effective steps to develop the road to become one of the major tourist destinations of Iran. In this regard, Nowadays the tourists are more interested to travel to this road and pass through the same road that their ancestors did and experience caravan journeys and visit ancient structures such as Caravansaries, water cisterns, cafes, shrines, castles, springs, sanctuaries, cemeteries, baths, markets, aqueducts and even the remnants of road and bridge flooring. 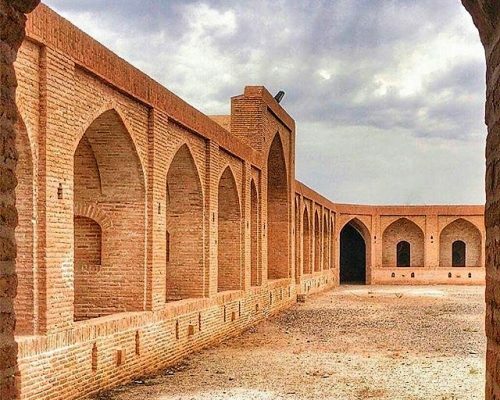 If you are eager to explore the silk road, Friendlyiran offers a Comprehensive tour package including en route cities, towns and historical sites.